January 2016 rain continues in Bali. Rain in Bali is a blessing for the farmers. Because of the rain to bring water. If the water is met, then the agricultural land may continue to produce rice. Because rice is a major requirement for human life in Bali. January 2016 is the season to plant rice in Bali. Rice was planted in the paddy fields in Bali. Farmers have been cultivating the land in order to be ready for planting. Clearly visible in many places have started to grow rice. Rice is grown based on the season and water availability. When water is plentiful, then that's the right time to start planting rice. Because from the beginning to grow rice until the rice begins to bear fruit, water should always be available. Rice fields in Bali when the growing season becomes interesting sights to be seen. Paddies rice crop has a beautiful view. Green rice terraces has a beautiful view. Ubud and Jatiluwih is the famous places and the most in the search for beauty staring at the terraced rice paddies. Many people ask, is there a schedule of planting by farmers to grow rice in the rice fields? Until now scheduled for planting paddy yet. Due to current weather conditions is uncertain, can not be determined, and unpredictable. So it is very difficult to determine the schedule of planting rice in Bali. Farmers rely solely on the existing water supply. If the water is estimated to be sufficient to grow rice, so when they grow rice. 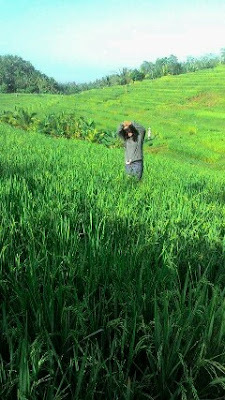 But, to be able to determine the right time to see the beauty of the terraced rice fields of Bali, tourists can come to Bali in February to April and September to November. Because usually in the rice fields in Bali has had a fairly high rice plants. So the rice fields in Bali have been met by green rice. If you look at the rice harvest, mostly rice looks barren, because all the rice has been harvested.